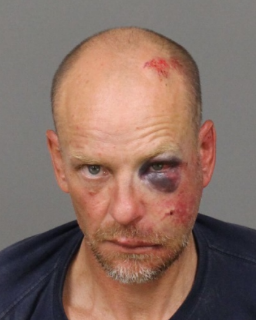 A Templeton man who got caught stealing a bicycle in San Luis Obispo received a black eye and a trip to jail Tuesday. The victim got his bicycle back. Jeremy Christensen, 43, allegedly used bolt cutters to cut the lock on a bicycle that was attached to a bike rack on the owner’s vehicle. An alert citizen saw Christensen walking away with two bicycles and notified the victim, according to the San Luis Obispo Police Department. The victim then confronted Christensen and, with the help of a witness, physically restrained the thief to prevent him from fleeing before officers arrived. The police department received a call about the incident at about 3 p.m.
Officers responded to El Capitan Way and Broad Street, where a “physical altercation” had occurred, according to a police department news release. When the officers arrived, they searched Christensen and found a hypodermic needle. Police arrested Christensen and charged him with grand theft, possession of burglary tools and possession of paraphernalia. Officers booked Christensen into the San Luis Obispo County Jail, where he remains with his bail set at $20,000. Bicycles can be dangerous. Always wear a helmet and eye protection. Good one! Iam so proud of the person that gave a beating to this scumbag. Right – he must have fallen off his (someone else’s) bike. Nor his last, quite likely. Expensive bike: yes. Total jerk: yes. But, you really want to get stuck with a dirty needle or worse? Not me. If you have a bike worth several thousands, it’s in your best interest to lock it with something other than a cable that can be cut. Also, you’d have to find the slimiest lawyer, but litigation is possible. If you caused major injury or death, then yes you would be held accountable. You have the right to take your stolen property back. It is called “replevin” as a legal action. You can protect your property with reasonable force if necessary. A punch or two to the face and wrestling someone to the ground would likely be reasonable to get your property back. I’m sure the victim of the theft acted somewhat impulsively when he saw the scum walking away with his bike and wasn’t thinking about hypodermic needles. He gave this guy the beating that his daddy should have a long time ago. Good for him. The owner has his bike because he did what was necessary rather than waiting for the citation writers to arrive and fill out a police report. The casualty rate for thieves should be much higher than it is. SLO is legendary for how they treat bicycle thieves. You just don’t f**k with someone’s bike in this town–people are touchy about it! Doesn’t this dude know that the REAL money is in succulents? He could learn some things from the ladies. Plus, people don’t feel the need to kick the s#! * out of you when they loose they’re front porch plants. Why not two black eyes!!! One for each bike, that’s fair and just. Guy. This person deserved to beat up and he deserved to be arrested. But your comment is asinine and racist. He may have evolved from stealing candy from children to stealing their bicycles. Hopefully he’ll realize that this continued evolution can be lethal and he gets help before it’s to late.